Once again, a sizable crowd of Russian took to the streets in central Moscow to express their indignation about the authorities and commemorate the last year's protests. Despite temperatures hovering around -17 Celsius, a sizable crowd of people turned out in central Moscow on Dec. 15 to participate in an unsanctioned meeting protesting the administration of Russian President Vladimir Putin. “Dear citizens, this event is against Moscow laws, please walk to the Metro in order not to be detained,” repeated policemen – who also numbered in the hundreds - over a megaphone throughout the meeting. The protest took place in Lubyanka Square, across the street from the headquarters of the FSB, the successor organization to the KGB. Buses lined surrounding streets with buses waiting to be used for detained protesters, and a helicopter hovered low, possibly in an attempt to drown out noise from protesters. Neither the police presence or the cold temperatures phased the protestors, a group that included people from across demographic lines. Families with children, teenagers with iPads and pensioners were all seen participating in the meeting. Reports on the size of the group vary; officials say the crowd numbered 700 while opposition leader Sergei Udaltsov insisted there were 5,000 participants. 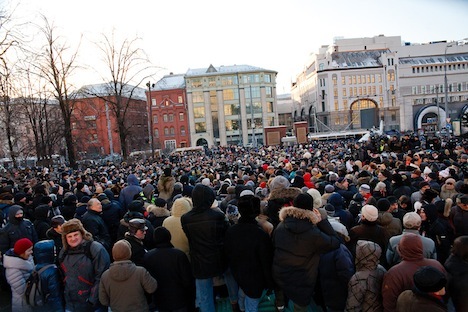 Protesters laid white flowers - the color of the opposition - on the Solovetsky stone, a memorial in the square to victims of the Gulag, erected after the fall of the Soviet Union. By attending an unsanctioned gathering, all of them were risking fines up to about $1,000, or $6,500 for organizers, as the result of a recent law signed by Putin. “I am not afraid to be here - Putin should be afraid of us,” said Lilia Sokolova of Moscow, who said that she had protested since the 1960s in the Soviet Union. “This is the warmest place in Moscow!” quipped longtime opposition figure Boris Nemtsov, who was Deputy Prime Minister under Boris Yeltsin. “I took the #45 trolleybus to get here,” he added. It wasn’t only supporters of liberals like Nemtsov who turned out, however. Nationalists, libertarians and gay rights activists also came to Lubyanka. The Communists, however, held their own, sanctioned rally earlier Saturday in a different part of Moscow. The one thing these disparate groups held in common was a deep desire to see Vladimir Putin leave office after almost 13 years in power. “The fish rots from the head,” said Valentina Ostak-Pengur, who rejected the idea that Putin’s current drive against corruption would result in anything significant. The group was denied a permit to protest earlier in the week after negotiations broke down. “I am furious that our protest demonstration was not officially sanctioned despite the fact that we had applied for the permission to hold a rally in time. We have never been violent. So, they have no right to deny us permission,” said pensioner Tamara Kozhevnikova. The most famous Russian anti-corruption leader both inside and outside the country, lawyer and blogger Alexei Navalny, came to the rally and and was immediately swarmed by reporters, photographers and fans. He stood in a scrum and greeted the crowd before being detained by the police. He was released later Saturday. On Friday, Russian investigators accused Navalny and his brother, Oleg, of fraud and money laundering - charges that Alexei Navalny rejects as politically motivated. Left Front leader Sergei Udaltsov and opposition activist Ksenia Sobchak were also detained. After about an hour and a half of allowing the protesters to mill about, the police began to detain people, dragging them out the square. People chanted, “Shame on you!” and “Russia Without Putin!” But the protest only ended when officers, with their arms locked to form a chain, pushed the crowd out of the square and into the cold Moscow evening.